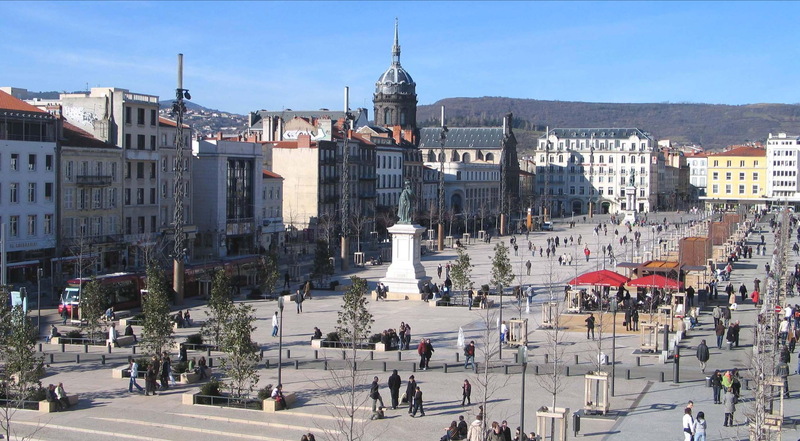 Clermont-Ferrand isn’t a name that readily rolls off the tongue for holiday-makers. The capital of the Auvergne region and situated more or less in the middle of France, it’s a long way from the coast and suffers perhaps from its larger more illustrious nearby city of Lyon – France’s second city. Clermont-Ferrand also has a reputation of being a ville noire – a “black city” where the emphasis is on heavy industry. The name conjures up images of depressed charcoal-faced communist ouvriers trudging emotionless through their predictable lives. But guess what? It isn’t: We arrived on a summer’s evening when local club (and former European pretenders) St Etienne had just beaten southern rivals Nice in a pre-season warm-up. It seemed to be taken seriously enough, judging by the number of green-striped jovial fans staggering about. “Allez les Verts!” I cried, shamelessly endearing myself to the tipsy football fans. There’s a good choice of eating to be found in Clermont. Ignoring pleas from our three boys for pizza and/or American-style fast-food, we settled for some traditional local fare at the L’Oustagou. It’s right beside the cathedral and the town hall. The interior is features a lot of timber and sporting paraphernalia from local rugby team Clermont-Auvergne decorate the walls. The feeling is rustic and mountainous in the middle of the city. As we pored over our menu in French, I attempted to regale my young sons with tales of the college year I had spent in these parts two decades previous and scratched my head trying to remember what the hell Truffade was. It turns out that it’s a signature hearty Auvergnat dish involving melted cheese and potatoes. That sums up the atmosphere in this unpretentious corner of France. It’s essentially an industrial city in the middle of undulating mountainous countryside that would put you in mind of parts of Ireland. It’s the ancient volcanic Pierre de Volvic stone of the locality gives the buildings a distinctive dark hue. Clermont is a handy-sized city with a population similar to that of Cork and with a similarly laid-back atmosphere that makes you feel relaxed in your skin as soon as you stroll its streets. It’s not trying to be chic and it’s not trying to be important. As with all French cities, tourist services are exceptionally good. But Clermont is not a city through which large international brigades of fellow tourists file. It’s all the better for it as it simply makes you feel like you’re a welcome guest – just like a tourist should feel. Rising above a sea of red tiled roofs, the dark-stoned cathedral (simply called the Cathédrale de Clermont-Ferrand) cuts an imposing presence from any angle – its gothic buttresses lending an air of Notre Dame to what is the heart of the mediaeval centre. The Cathedral also serves as a handy marker that helps you to get your bearings quite easily as it can be seen from most parts of the city centre. Rue du Terrail snakes its way to the east and north from here, winding an irresistibly enticing well-preserved course that runs into Rue Pascal (named after local boy and mathematical genius Blaise Pascal). Here, you’re in a wonderland of antique shops and dusty old bookshops, the street accentuated every so often by huge porticos. For this older section, there’s a slightly shabby feel to it all as many of such establishments appear to be closing. One antique shop owner told me how the demand for antiques took a sudden an unexplained dive about 15 years ago, while the book trade everywhere is suffering in the information age. Amongst the surviving book and antique shops are internet cafés, wine shops, shoe shops and the occasional tattoo parlour. By the time you turn right into Rue du Port, the atmosphere is brighter and the street is lined with traditional food shops and a variety of kookie retail outlets. The cobbles gently incline towards the eastern edge of the mediaeval quarter that ends at the Place Delille. Just a couple of hundred metres west of the Cathedral, the expansive Place de Jaude feels like quite a soulless space after the more intimate and atmospheric experience of the warren of narrow streets surrounding it. But it is the commercial hear of the city – through which the Dublin-esque tramways hum and clang and where large crowds can gather to noisily celebrate local sporting triumphs or to engage in the French national sport of protesting. The square is lined with smart-looking large stores and belle époque cafés. Its stand-out feature is the large statue of Vercingetorix, resplendent on horseback atop a tall pedestal. For anyone familiar with the Asterix cartoons, you’ll know that it was he who led the Gauls to victory against Julius Caesar’s army in nearby Gergovia in 52BC. Evidently, they’re still pretty proud of that one around these parts. Michelin was, for many years, the flagship industry here, employing over 30,000 people at its height. Despite large-scale cutbacks over the last 20 years, it’s still one of the largest tyre manufacturers in the world and they’re still an important force in the town. The aforementioned battle site of Gergovia is worth a diversion to get a feel for the local ancient history about which they’re still evidently proud today. Situated about 12km south of Clermont itself, the modern-looking interpretative centre is situated on the plateau of the battle site and features the history of the area going back to Neolithic times, as well as a 12-minute video presentation of the Battle of Gergovia. Closer still is the Puy-de-Dome. Instantly recognisable from the packaging on bottles of Volvic mineral water, this mountain towers over Clermont and you will find it hard to pass up the opportunity to visit while you’re here for any length of time. It’s a similar distance from the city as Gergovia. There are those who climb to the top on foot, but I’m not one of them – particularly when there’s a road all the way to the top. The final 7km is a road that tolls you €6 for the pleasure. The other option is to park at the bottom and hike to the top – a journey that takes an hour or two. The views from the top of Clermont-Ferrand and the surrounding Parc des Volcans is truly spectacular – a feast for the eyes while your lungs fill up with pure air of the Massif Central. For an even more intensive and family-friendly way of getting intimate with the area’s volcanic heritage, you might want to try Vulcania. It’s a sort-of theme park with a scientific bent that serves up an entertaining interpretation of what volcanoes are all about. It features lots of multi-media experiences that include films, fun rides and a “what if?” scenario that dramatically illustrates the consequences of the region’s long-dormant volcanoes coming back to life. Getting There:	No direct flights from Ireland to Clermont-Ferrand. Aer Lingus fly direct from Dublin to Lyon (220km away) four times per week. Regular flights via Paris Charles-de-Gaulle. 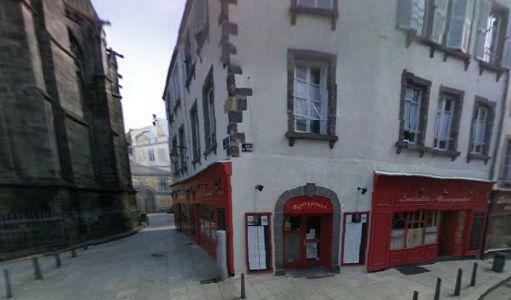 Where to Stay:	We stayed at Hôtel des Puys, 16 Place Delille, 63000 Clermont-Ferrand, France. Tel +33 4.73.91.92.06, www.inter-hotel.com – a three-star hotel in the city centre within walking distance of all the main attractions and facilities. 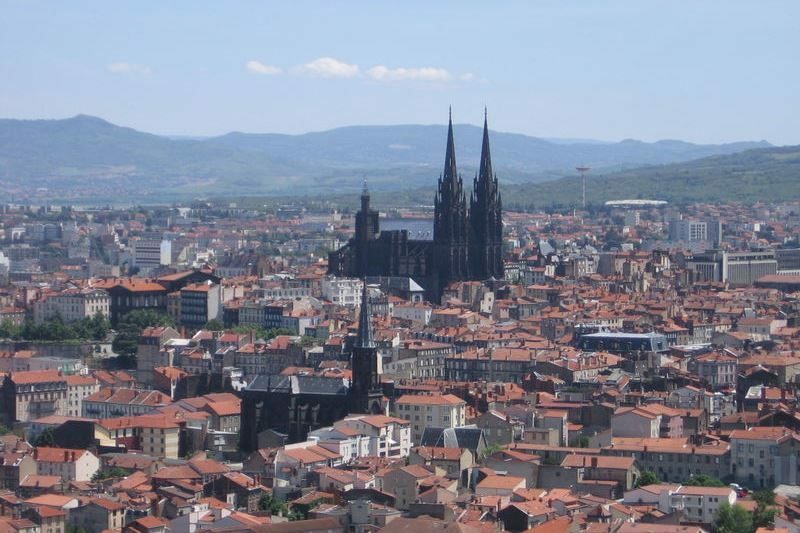 The Clermont-Ferrand (www.clermont-fd.com) and the Auvergne (www.auvergne-tourisme.info) websites give a list of contact details for all accommodation and other tourist facilities in the area. When to go:	Summer, when the continental warmth is tempered by the closeness of the mountains. What to See:	The Parc des Volcans – virtually on the doorstep of the city, this extraordinary landscape of sleeping giants of volcanoes is a unique sight. 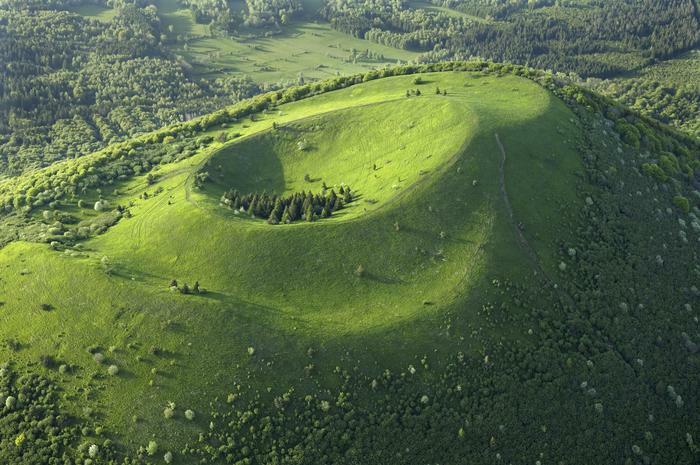 For further information, see www.parc-volcans-auvergne.com or ring +33 4.73.65.64.00. What to Buy: A book of Baudelaire poems from one of the dusty old bookshops on Rue Pascal. Even if you never get around to understanding them, it’ll always look good on your bookshelf. Ahhh… Brings back memories. I was one of the Irish students in 95 near there – St Etienne. Allez les Verts! I was one of those who went there on the way seeing Leinster beat Clermont Auvergne. Allez les Blues!